Barcelona can be yours! Are you into Barcelona? Have a marvelous holiday by discovering this international metropolis and also have privacy and comfort in your own villa in one of the villages near this capital and largest city of Cataluña! A 2-in-1 holiday, what more do you want? Make this exquisite situation yours! Why is this beautiful city, with so much worthy secrets, interesting for you? Its unique numerous. small neighborhoods (barrios), streets, historical remains, architecture from for example Antoní Gaudí, art made by artists like Pablo Picasso? Or are you a football fan and do you like to visit the FC Barcelona stadium and the FC Barcelona museum? There are so many reasons to travel up here and to stay for a day or more. Is it not because of the coolest clubs and the greatest night life, it might be because of a visit to the Formule 1, the Montjuïc or the Olympic area, where the Olympics were held in 1992, for what Freddy Mercury made a kitschy anthem 'Barcelona' and a part of Barcelona got renewed and extended. Wheter you do a city tour or you visit one of the concerts from famous artists and bands like Madona, Shakira, James Morrison, Lenny Kravitz, UB40, The Cult or another artist/band, shopping is unmissable. Now even more! As Barcelona becomes more and more a ´Walhalla´ for fashion shows and cloth designers. Always good to knowNo matter what kind of holiday you prefer, it's a fact, Barcelona is the place to be! Also for sun worshipers we have a perfect spot at one of the various beaches. Your visit doesn't need to be perfectly planned, this keeps it possible to let this great city surprise you by its mix of historical and high-tech influences merged with natural aspects. One thing's for sure: No matter what your age is, weather you are with your family, romantically together or with a group of friends, Barcelona has always something miraculous to discover and to encounter the South European rhythm. Find out what's in it for you! 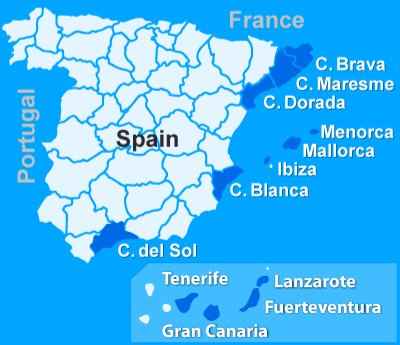 Location of Barcelona: on the Mediterranean northeast coast of Spain near the Costa Maresme. Language: Catalan and Spanish. Official street signs are written in both languages. Opening hours traditional shops: 10:00h – 14:00h, 16:30h – 20:30h or 21:30h The 'siesta' can variate a bit, depending on the company. Passport/ID card: When you pay by bank card or credit card you may be asked to show your passport or ID card. Winter sales starts in the second week of January. For the summer sales you are good between July and September. Residents from outside the EU may have a restitution of the Value Added Tax (VAT). Throughout the year Barcelona has a pleasant climate, even though the temperature can go up to 40 degrees during the high summer. The spring and autumn are most appropriate (comfortable) for city trips. August is experienced to be the most busiest period of the year, though you have a chance from half August till early September 10% of the traditional shops, restaurants, etc. are closed as it is the Spanish holiday period. Before you go to explorer Barcelona it is advisable to do some preparation. This way you prevent missing a spot you wanted to see or find out when you are here that you have a lack of time, because when you are out here you can be distracted by so many things or getting overwhelmed and do not end up anywhere but only the main street. On for hand you can easily decide how much time you like to spent in Barcelona and what you are able to see during your stay. No matter what, as plans are there to be changed, make sure that after you wandered around up here, you have enjoyed what you have seen and what you have done! The public transport is quite good. From the coast line you can travel by train to this world city. Besides that, there are straight bus lines from Tossa de Mar, Lloret de Mar and Blanes for example. Aerobusses are outside Terminal 1 and Terminal 2 and drive from the airport to the center of Barcelona, like 'Plaça de España' or 'Plaça de Cataluña'. Between Terminal 1 and 2 the service is for free. Car rental: When you arrive by plane you are able to rent a car at the airport. But maybe it is easier to rent it before arrival and make your rental complete on the web. Of course it is also possible to rent a car for a day or so during your stay. Whenever you decide to rent a car, be aware of the traffic rules. In Barcelona the traffic rules are generally identical to larger European cities. Nevertheless pay attention to the signaling panels, especially the ones which show the maximum speed, as there are quite some photographic flashlight machines. A less common thing are the amount of motors, scooters and mopeds driving around, like madmen, in Barcelona. They say it has the most of it per inhabitant of Europe. All of this makes the traffic in Barcelona quite busy, together with a lot of traffic lights, the fact that car drivers like to use their horn or like to make nonverbal signs with or without verbal language. And above all, do not be surprised when a motor suddenly passes from the right or a truck is going left without using his traffic indicator. As in whole Europe it is not allowed to call behind the wheel! When you decide to rent a car, inform about the regulations of the car rental. Some general regulation: minimum age of 23 years, driver license at least 3 years, pay by credit card, etc. As a reminder, do not forget to insure also the passengers. - Train to 'Barcelona Sants' (Estacio Sants) or one of the stations at 'Passeig de Gràcia'. Depending on where you come from, the airport of Barcelona 'El Prat de Llobregat' might be the only airport to fly to. Maybe you are able to fly to the airport of Gerona/Girona or Reus, mostly by low cost airlines.From the airport Gerona/Girona rides is a straight bus line to the center of Barcelona. Within 1,5 hour you are there! Also from the airport of Reus you are able to travel to the center of Barcelona. There is a transfer from the airport directly to Barcelona. Another option is to go by bus and make a pitch stop at the railway station of Reus (approximately 10km). Here you can take the train to Barcelona Sants. Let´s Seg your Way in Barcelona. With guide or just you and your family/friends. There are a lot of ways to travel around in Barcelona and its surroundings, as Barcelona has more then approximate 633 sq km to explorer. Although you see a lot when you go by foot, it is not possible to reach everything in a limited time. Therefore you can rent a car, scooter or Segway, travel by public transport (train, bus, metro), by boat or by bike. Feel independent, go when and where ever you want. Rent a car! Besides Barcelona you can visit the Costa Brava, Costa Maresme, go in land to for example Montserrat or Andorra. When the weather is nice enough for you, you can see a lot more and stop on more places instead of with public transport. Besides that, you can enjoy real life on your bike while you get some fresh air at the same time! Do you want to keep explorer, but you want to give your feet some rest? You can individually catch one of the 100 bus lines between 05:00/06:00 till 22:00/23:00h which often have a 8 or 10 minute frequency. And like in many other cities there is a night bus (Nitbus) from 22:20h till 06:00h passing every 20 minutes Plaça de Cataluña. The 'teleférico' is a great possibility to go up the mountain of Montjuïc, while you meanwhile have magnificent unknown views from the harbor of Barcelona, the beautiful nature as from representative famous highlights of Barcelona: La Plaça de Cataluña, La Sagrada Família, La Catedral, El Puerto, La Villa Olímpica,... With maximum 8 persons per 'teleférico' you go up where you can hop on or off at Parque de Montjuïc, Mirador and Castillo de Montjuïc. A city trip without traffic jam! Just as when you travel by bus or train you are able to choose out of different kind of tickets. Have fun on a scooter and move comfortable through the streets of Barcelona, without hassling to find a parking, being squeezed as a sardine in a overcrowded metro or train and do not give a way money for expensive taxi fees. Besides that, you just experience the environment from a different perspective. When you grab a cab you can stop one at the street or call to the central service, whereby the taxi will charge in about 3euros extra. Before you get in, it is advisable to ask for the price to your destination; before you get a sight-seeing tour through whole the district, while you only need to be two streets further on. Keep in mind the price also depends on circumstances like the time of the day and week, if you take luggage with you and if you go to the airport. Do you like to travel a bit more far, practical or comfortable you can take a train. The trains are divided in three distances and different kind of companies, as we have the short distance, medium distances for in Catalunya and the large distances of more than 400km. For public transport there are offered all kind of tickets. Of course you can collect a single ticket, but depending on your purpose in Barcelona and your plans, maybe a T-10 (10 travels per ticket), T-día (ticket for 1 day, also possible for 2, 3, 4 or 5 days), T-mes (ticket for 30 days) or a T-50/30 (50 travels in 30 days) suits better for you. When you want to see so much, but you do not know where to start, you can make advantage of a good organized way to see the highlights of Barcelona in a short time, but still being independent! Take your chance and make your city trip with the 'Barcelona Bus Turístic'. The bus is without roof. Though down stairs you can sit nicely inside. There are tree lines running through Barcelona. The blue, red and green line stop at you all kind of sight-seeings and well-known places in Barcelona: Plaça Cataluña, Casa Batló, La Pedrera, Francesc Macià, Parc de l'Espanya Industrial, Creu Coberta, Poble Espanyol, Anella Olímpica, Telefèric de Montjuic, Olympic Museum, Miramar, Castell de Montjuic, Port Olímpic, Barcelona Zoo, La Sagrada Familia, Parc Güell, Tramvia Blau Tibidabo , Mercat de Sarrià, Palau Reial, Playa del Bogatell, Avenida Diagonal, Paseo de Garcia, Camp Nou,... It is up to you how long your tour is going to take and where you exactly hop on or hop off. Another company is 'Barcelona City Tour'. It has two different routes, green and orange, to guide you through the city and let you pass by and give you the ability to hop off at 34 stops. The good thing about the 'Barcelona City Tour' is that they have sliding roofs. So you are high and dry, just in case it starts to rain. Do you like to know more about Barcelona without reading half of the library, but still get a lot of back ground information? Take advance of one of the other guided tours! Make a guided bike tour. Discover the beauty en the culture of the city, while you pass by the highlights, phenomenal squares and narrow alleys. Professional guides lead you through one of the districts of Barcelona. Another option is to combine it with tapas, with the so called 'Tapas Walking Tour'. High in the sky you can enjoy in a special way perfect views on the coast line, the network of the streets and the squares of the city. Depending with which company you fly with, you can fly over Port Olímpic, Port Vell, Montjuïc, La Barceloneta, along the WTC, Torre Agbar and La Sagrada Familia. Do something unique! Make a night trip and drive around through Barcelona in one of the exclusive limousines. More and more popular is the so called 'Segway'. It is a funny way to go with experienced guides along with the officially safe routes. Why not pay less? Hereby some possibilities with discount tickets. Entrance with 1 ticket for 5 museums! With this ticket you have entrance to 6 museums in Barcelona. 1. Fundació Alorda Derksen - National and international contemporary art. 2. Fundació de les Arts I els Artistes - It houses the 'Museu Europeu d'Art' (MEAM). 3. Fundació Foto Colectania - Photographs from 1950 until today. 4. Fundació Francisco Godia - Spanish ceramics and medieval art. 5. Fundació Suñól - Exhibition of contemporary art of Josep Suñol´s collection. A great chance, as some of the pieces have never been shown in public before. Including art works of Picasso, Miró, Gaudí and Tàpies for example. 6. Fundació Vila Casas - This foundation consists out of 3 contemporary art museums and 2 galleries for temporary exhibitions. The art is from the 60s until today. Are you experienced in traveling, do you like to do things on your own instead of organized, do you know where you want to go or do you like a challenge? Make a city trip with the Barcelona Card. This great card gives you endless options for a day of sight-seeings or a short visit to for example 'La Sagrada Família'. You have free unlimited travel on Barcelona's public transport, including metro and city buses. When you arrive at the Airport of Barcelona you are already able to collect your card. As soon as you use the card, it will be activated for the numbers of days you have indicated. If this is not already a great offer, you also receive special offers to have free entry to Barcelona's top visitor attractions. With the 'Barcelona Metro Walks' there are 7 routes to discover Barcelona. Besides a manual guide you will get a 2 days ticket (consecutive) to use the metro and the bus in this metropolitan. More, detailed information and material (like a city map, the sale of tickets of the Barcelona Card e.g.) can be provided at the 'Turisme de Barcelona' and 'Turismo de Cataluña'. Where can you find a tourist information point? When you visit Barcelona during the main summer season it is possible the temperature rises up till 40 degrees. If you have the energy to go out on the streets, you might feel more comfortable to wear your bathing cloths. For some people it is normal to walk with naked torso, just realize this is not appreciated as well. Nonetheless, please notice that it is not appropriate to wear these kind of cloths in shops, at the streets or in a supermarket. The same thing counts (of course) when you visit one of the highlights. During the low season and the winter the temperature between day and night, morning and afternoon, can have a very big gap. Therefor, do not let yourself seduced by the nice temperature and the warm and bright sun during day time. Just take a sweater, jacket or something else with you which can keep you warm when it starts to get chilly. The good thing is: Barcelona is generally a very safe city! Aggressive and violent behavior is shown only rare in nightlife. On the other hand: Supervise and control your personal belongings! It is not without reason there are officially published city guide cautions. To ladies approach two boys around 25 years to buy a flower for 1,50euro. The ladies are kind, nice, not too bad looking and they are not even obtrusive. Everything seems okay and as it is the last moment in the city for the boys, they decide to take their wallet. Before they can even realize the lady helps them to take the money. A little bit surprised the lady takes out the 1,50euro for a flower. At that moment it still looks all trusted. Meanwhile the boys continue their walk to the bus station. When they have turned around, the ladies go to one and another. The most impossible thing has just happened! One lady says to the other : “Too bad he only had coins in the pocket. I thought they just arrived.” The other lady responds: “Luckily I saw the 50euro in his wallet.” With a grin, she shows the 50euro billet she took out of the wallet of the unsuspecting boy. Let it be clear, it is always possible you get pick pocked, yet you can take some prevention. Famous places for pickpocketing are for example La Rambla, at the end of the port and the lower part of the Raval neighborhood and of course all the famous places of the highlights. Never lose your belongings out of sight. Or better, always ware a bag on your hips or otherwise close to your body on the front of your body! Put your money on several places or better divide it between the people you travel with. Dress 'normal' clothes, be like the local people. 18 degrees might invite you to wear a short and a razor top, though more than 3 quarter of the locals will not even get this in his mind. In the contrary, the chance is more like it they will wear their jacket and scarf. During your stay, please leave your Hawaii short at home. It is not about the taste, but it emphasizes the fact you are a tourist and such more a potential victim. Try to keep guidebooks and maps out of sight. It is not a crime to use them, but because you are easily distracted by it, this does invite pickpocketing. “Do not show off it is rather not to be seen”, so keep your newest phone in your bag and do not leave it on a table. Do not hang your fancy camera all the time around your neck, or wrist. You are a social person and likes to know the locals, but please do not be too social when you are on a city trip. A lot of times the crooks work in groups. While you have a nice conversation, they steal meanwhile your belongings. Even the onces you did not show in public. Besides that, maybe you give more information during the conversation then you even wanted to give. Do not play street games with cards or other gambling games. You know you are going to loose the game and probably other money and belongings. Just a tip at least: If you are not assertive make at least the impression you are, … practice shows people who are insecure, lonely, having a bad day, etc. are the first potential victims. Be aware of prices. When you take a diner in one of the restaurants or you take a drink somewhere,... check the menu before you take a seat. And keep in mind some bars, cafés or restaurants have an extra charge when you are sitting at the terrace, outside. Have a great evening at one of the 'Flamenco (diner) shows' and see passionate dancing, the authentic Spanish gypsy dance style which is really extraordinary. An spectacular evening for everyone. Combine sun and ice! This is possible in the 'Barcelona Ice Bar'! Prepare yourself for -5 to 10 degree temperatures in this bar. Luckily you will be equipped with coats and gloves when you enter. Take a seat at one of the chairs or lounges and take a cold drink, all made of... ice! Do you like to warm up a bit? No worries and grab a cocktail on the beach terrace. Take a rest during your stay and relax in one of the Spa Centers or Arab Pools in Barcelona, which you can find among your way through the center for example. To introduce you the Spanish temperaments of lthe life outside, you can join a tapas tour. During this tour you taste all kind of tapas in various tapas bars and restaurants. This way you will get a whim of the life of Barcelonesas. A lot of the history of Barcelona has remained. Per district you can read some tips of what is most worth to visit. This may help you to make your preparation for your city trip a bit easier. Do not stay behind and visit like every other visitor of Barcelona at least 'La Rambla', the most famous street of Barcelona, which runs through the old center of Barcelona, from Plaça Cataluña to the east, to the 'Monument of Colombus' (where he came ashore in 1493), the old harbor 'Port Vell' (recognized by its ‘new’ swing bridge and Barcelona Aquarium, IMAX cinema, terraces, Maremagnum with its shops e.g. ), 'Barceloneta' (the maritime district built in the 18th century), the beach of 'Barceloneta', and 'Port Olímpic' (the old industry area destructed and rebuild for the Olympics in 1992) with the highest building of Barcelona on its background. You can not miss the kiosks, stands with birds and flowers, musicians and mime players. And of course famous buildings as the classic building 'Palau Moja', the Boqueria market (colorful food market, also called Mercat de Sant Josep), the opera building 'Gran Teatre del Liceu', 'Plaça Reial' decorated with Palm trees and neoclassical carriage lanterns designed by Gaudí, the museum with waxen figures ‘Musea de Cera’ and various other impressive manors are worth a walk along the 'La Rambla'. During day time it´s an impressive palace in Barcelona with innocent fountains. When the dark falls, the fountains start to live. They dance on the music and change colours. Nearby you find the 'Museu Picasso', housed in 5 medieval quarters on 'Carrer Montcada'. These refurbished buildings retain their original external appearance and their spacious interior contains a unique pictorial treasure which makes this museum one of Barcelona's biggest tourist attractions. Other interesting places to visit are for example 'Palau Güell' (Gaudí’s first big assignment), 'La Llotja' (stock market) and 'Barcelona Aquarium'. This marine center let you see more of the Mediterranean, where you can walk under the sea surrounded by sharks and other underwater creatures. During the evening there are legendary attractions: The 'Magíc Fountains', a spectacular show combining color, light, motion, music and aquatic acrobatics. And of course 'Plaça La Mercè' can not be missed as 'La Mercè' is one of the great festivals celebrated around the 24th of September. The square is named after the 'Church of La Mercè', featuring an imposing fountain depicting Neptune. Before the renewal of the urbanization, before the Olympics in 1992, it was divided into three stretches including Barcelona beach. Specially for the Olympics they improved Barcelona's seaside drastically. Barri Gotic is a real nice area with the gothic architecture combined with other styles. And of course don´t forget the shops which are less touristical. Jewish Quarter (El Call, in Catalan). The area 'Barri Gòtic' has a beautiful Gothic cathedral with a roman 'Capella de Santa Llúcia' and monastery entrance, a Roman temple as fundament and a Morish mosque. It took more than 600 years before it was finished. A lot of authentic buildings are remained and even still in use, either in another setting, like the community offices at 'Plaça de Sant Jaume', 'Palau de la Generalitat' (Catalan government building) and 'Casa de la Ciutat' (town hall of Barcelona). Probably on your way to this area you will pass 'Carrer del Bisbe' or 'Carrer Petritxol' with superb architecture. You will go back in time in the area 'El Born' with the church 'Santa Maria del Mar' and the numerous manors from the 14th century. For people who love animals and of course families 'Parc Zoològic' or 'Zoo de Barcelona', the zoo of Barcelona without balusters, is unmissable. It has more than 400 species of animals, including aquariums in which are dolphin and whale shows. And when you are there, take a breathtaking moment in 'Parc de la Ciutadelle' with sculptures and boat lake. Or just grab some fresh air in a nice environment. Chocolate dream in Barcelona. The Chocolate Museum where you can even taste a bit! Chocolate lovers be aware! Always wanted to discover the origins of chocolate? Take a look in 'Muesu de la Xocolata'. Even though you are not really a person to visit museums, this is definitely different than all the others! And when you can not get enough of it, start a 'Chocolate Tour'. Do not forget shops as Oriol Balaguer, Xocoa, Cacao Sampaka and Ochiai. Fresh fruits and vegetables? Mercat de Santa Catarina has happily coloured fruits and vegetables, that much that its roof has an expressive structure and reproduces the colours aswell. And if it is not for what they sell, the building is already a spot itself. Art goes trough the whole immense exquisite city Barcelona. This former 'no-go' area has grown to a 'must have been' with a lot of colours and atmosphere with all the bars, restaurants and lounges. Take a look at 'Rambla del Raval' with Botero's giant cat sculpture, 'Antic Hospital de la Santa Creu' and the MACBA. The 'Museu d'Art Contemporani de Barcelona', which is in a light, airy building, hosts a wide variety of exhibitions and artistic, academic and recreational events. A special piece of culture and architecture together is 'Sant Pau del Camp Romanesque monastery' dated from the 10th century. The church, cloister, chapter house and abbot's residence were built between the 12th and 14the centuries, and painstakingly restored in the 20th century. Of course Gaudí's art can not be missed. Unfortunately a lot of tourists pass by his art work 'Palau Guell' quite unnoticed. Which is totally undeserved. The melting of structure and decoration and the influence of the Moorish architecture. When you are out there, do not forget to take a look at the roof, which is very spectacular. Barceloneta and the old harbour, 'Port Vell', has berths for pleasure cruisers and yachts, various of shop, offices and leisure amenities, services for boats and quays used by the fishing fleet. 'Las Golondrinas' offer harbor rides and cruises along the coastline as far as the Forum. A lot of typical restaurants serving a wide variety of rice dishes, fish and seafood. Maremagnum - 7 days a week Maremagnum has its doors open, except on the 25th of December and the 1st of January. It has various shops: shoe shops, accessories, jewellery, cafés, chocolate shops, toys, decoration, souvenirs, photography, computer, nightclubs, bars, gastronomy, etc. World Trade Center Barcelona - At 'Moll de Barcelona' is a convention center (430 seater auditorium), offices, retail area and 5-star hotel. Torre de Jaume I - The second highest cable-car tower in the world, offers you breathtaking views of the waters in the harbor below (as it is 100 meters above the sea). Immersed in a complete process of renewal, the Olympic Village, built near the seafront to house the athletes for the 1992 Games. At the opposite is the Olympic Marina 'Port Olímpic', used by sailors and the local community. Besides sailing facilities and schools it has a wide variety of restaurants and bars. At the foot of one of the towers in 'Port Olímpic' is a giant fish, designed by Frank Gehry in 1992. It is a huge structure of 35 meters high, made from woven strips of copper-coloured steel. One of the latest urban planning interventions is 'Forum Precinct', one of the biggest cultural and recreational public spaces, consisting out of the Barcelona International Convention Center and the Photovoltaic Cell, providing solar energy. It also has a marina, an innovative bathing area and vast plaza. 'Vila Olímpica' consists out of more than 200 buildings all in different kind of styles. This modern area has in general spacious accommodations. 'Avinguda d'icària' is the main artery in the Olympic Village. Enric Miralles designed expressive pergolas with abstract shapes. 'Gran Casino de Barcelona' in 'Port Olímpic' with slot machines, table games and other games. And to complete the day you are able to have diner in one of the restaurants or have a nice dance in de discotheque. Like in every place you adapt to the place where you are. In a casino it is common to follow strict dress code, so no offensive behavior, cheating, sport wear, shorts, t-shirts etc. are allowed. Maybe unnecessary to mention, the minimum age to enter is 18 years and you will have to bring your passport or identification card with you. Let your holiday get a finishing touch by a moment on the beach! The 'Nova Icària' beach is a great place to relax and enjoy the nice weather. Get some fresh air by walking along the beach. Do you like to eat something or just take a drink? There are some nice restaurants with even a terrace and a garden right on the beach! A real advice to go to is the 'Cementiri del Poblenou'. It is the first of its kind in Barcelona since 1775, when Bishop Climent blessed it. Napoleon's troops destroyed it in 1883, but this could not prevent the rebuilt in 1849 what let the architects, modernist and new age sculptures keep exist. Are you more into nature aspects? 'Parc Diagonal Mar' has 14 hectares of green areas alternated with lakes, metal pergolas, trees and skyscrapers with spectacular views. Maybe a bit awkward but it is true, this modern district is not the best place to be for shopping, though there is a small shopping mall. 'El Centre de la Vila' offers some shops and a supermarket. Is shopping your sport? In the district nearby, 'El Born', you can find some nice, unique boutiques and more. The heart of Barcelona is 'Eixample-Gàrcia', with its rational grid layout, in which 'Eixample' expresses Barcelona's personality, with its modern houses and contemporary view, and 'Gràcia' epitomises the old rural villages which were annex by Barcelona, without losing their character. Spectacle versus religion as mass tourism versus faith: The last forty years Antoni Gaudí dedicated his life to build this fascinating cathedral. 'La Sagrada Família' is the face of Barcelona, which has been blessed and officially been consecrated by Pope Benedict XVI on the morning of the 7th of November 2010, 128 years after the first stone was laid in Barcelona. The church is steeped in religious symbolism to intertwine the natural and the spiritual. When Gaudí was fatally hit by a tram in 1926 others went and still continue his devotion. Luckely Gaudí left large plaster models, key elements and blury drawings. Nevertheless these left behinds leave much undefined as much as Gaudí changed his mind all the time during the development of La Sagrada Família. Architects, like Oriol Bohigas, Jordi Bonet, joined the completion of the church. For a long time a lot of people thought it was a permanent ruin, unfinished and unfinishable project. According to Gaudí time and budget is not a matter of issue “In the Sagrada Família, everything is providential”. Until now nobody has any idea about how much money has been spent to the church, neither anybody knows how much they will spent. The source of income exists of a never-ending source, more than 2 million people visit 'La Sagrada Família' and pay 12,50euro to go inside, together with the gifts and investors all the architecture works are possible. The last project before Gaudí started with La Sagrada Familia, 1 of the symbols of Barcelona. Other works from Gaudí is for example 'La Perera' (better known as Casa Milà) and 'Park Güell'. 'Casa Milà' is officially designed as a residential block, today a part of the building is a cultural center. The roof is impressive with its forest of sculptural chimneys. Barcelona would not be anywhere without 'Park Güell', a master piece where in you find the finest examples of Gaudi's fantastic imagination. Gaudí's landmark continues in the north of Gràcia with for example 'Casa Vicens', Gaudí's first major project. Another impressive building is Casa Batlló, with the eccentric chimneys and the giant dragon part on the roof. In this row of Gaudí's influences 'Park Güell' can not be missed. Up a hill, 'Carmel', Gaudí got the assignment to built a garden with different kind of architectonic elements, recreation areas and ornamental buildings. With the purpose to built an exclusive residential district. The project, of 17-18 hectare, fail, though it left the most original breathtaking park behind, including 'Casa Muesu Gaudí' and Casa Güell. The design Gaudí used shows the merging of his work with nature. Besides that Gaudí used a lot of mosaic with glass or ceramic. Of which the long undulating couch has been made, the i-catcher of 'Park Güell'. And do not forget about the lizard, which is the symbol of 'Park Güell'. When you wander around you will notice that in none of Gaudí's work a straight line can be found, just as in this astonishing park. If you really want some nice panoramic views of the city, go to 'Park Güell'! In the heart of Gràcia is 'Plaça de La Vilas de Gràciasurrounded' surrounded by a maze of streets with in the center of the square a clock tower with a belfry at the top. You do not want to miss modernism architecture? In the early 20's Lluis Domenech I Montaner built 'Hospital de Sant Pau'. It is an impressive building, covers a surface area equivalent to nine blocks of the Eixample. Imagine it is a nice evening and you just have had diner. You can go out in one of the pubs to do a drink, walk along the beach or something. It is a great idea to go to 'Cinemes Verdi'. It is Barcelona's leading art house cinema for original language-version films. Shop alert! Fashion outlets on the Passeig de Gràcia: Furest, Miró, Armand Basi, Loewe, Camper, Mango, Replay, etc. Barcelona wouldn't be Barcelona without art, culture and historical remains. 'Fundació Francisco Godia' offers medieval art, ceramics, modern painting collection. For the ones who can not get enough of modernism, you will be totally happy with a visit to the 'Museu del Modernisme Català'. Sports is all about fun and being the best. In general sport is a part of education. Here in Cataluña especially football is a part of it up here. Traditionally the most important clubs of the autonom regions Cataluña and the city Barcelona, are FC Barcelona (founded in 1899) and RCD Espanyol (founded in 1900). 'Camp Nou' is the home base of FC Barcelona, designed by architects 'Fransesc Mitjans Miró' and 'Josep Soteras Mauri' in 1957. With the collaboration of 'Lorenzo García Barbón' 'Camp Nou' is the cathedral of the football world ! It has a capacity of 99.354, which makes it the biggest stadium in Europe. At first the official name was 'Estadi del FC Barcelona', which all changed after a vote made by the club membership during the season 2000/2001. The official name is since then 'Camp Nou' (new ground). Besides the football field, Camp Nou offers inside a chapel next to the dressing room, a presidential box, a VIPs lounge, a perss room, several television studios, a sport medicine center, a veteran players area, the FC Barcelona club museum, the nursery and offices. The famous road, Avinguada Diagonal. You can´t get lost on that way. Both sides are the enterances and exits of Barcelona. The districts (Les Corts, Sarriá and Sant Gervas) are cut in two by Avinguda Diagonal, Barcelona's broadest and most important avenue, which also cuts Barcelona itself in two from west to east, for 11km long. And of course for shoppers there are massive department stores such as 'El corte Inglès', shoe stores, exclusive shopping mall, brand-name shops, jewelery shops, prefumeries, art and plenty of great gifts. Do not miss 'Pavellons de la Finca Güell', one of Gaudi's most richly imaginative works, and 'Muesu-Monestir de Pedralbes'. This monestry has been home to a community of nuns from the Order of Saint Clare since 1327, and in 1983 opened some of its rooms to the public, converted into museum galleries with collections of paintings, ceramics, silver and goldware and furniture. Of course the chapel of Sant Miquel belongs to it. 'Maternitat'. These gardens are worth a visit because of its intersting artitectural ensemble combining modernisme and noucentisme. 'Cosmocaixa' innovative educational centre of fosters scientific experimentation through observation of natural phenomena. With the 'Tramvia Blau' (a blue train, operating for over 100 years), you can transfer to the funicular, which runs to the top of Tibidabo. On top of this mountain you find 'Parc d'atraccions Tibidabo', an amusment park features some 30 rides and attractions, such as the 'Museu dels Autòmates', the watchtower or 'Talaia' (the ferris wheel and plane). Through the 'Parc de Collserola' you have unique a viewing point, besides that it is an popular place for walkers, joggers and cyclists. One of the prettiest squares is 'Plaça de la Concòrdia', the heart of the former village of 'Les Corts', annexed by Barcelona in 1897. A very explicit piece of art is 'Torre Agbar', the city's symbol of an emerging Barcelona that holds its head high among the great business centres of the world. Because of that it is situated in the new technological and business district known as 22@. The 4.500 coloured lights which show 40 different colours make the tower stand out to conquer the sky and become the center of everyone's attention. Inspired by what Gaudí left behind and the hills of Montserrat, it rises from the ground with the power of lightness of a geyser. The 2 non-concentric oval cylinders crowned by glass and steel dome (250.000kg of steel ) is 142 meters high, excists of 2 skins, where in ara 31 spacious floors. Places from where you can see Torre Agbar: Montjuïc, Poble Sec, Portvell, Port Olímpic, Carrer Casp, Meridiana, Bac de Roda, Teatre Nacional de Catalunya, Avinguda Diagonal, la Sagrada Família and Parc Güell. How many lights can you put on a building? The Torre Agbar in Barcelona shows it are quite a lot. District @22 is the sign of the future and technology, nevertheless there is a combination with nature as Parc del Centre del Poblenou shows with its shady oasis of calm in the middle of the city offering a new experience to visitors. Outstanding features include the different pictorial and sculptureal elements lined out in this park. The park stretches along the Avinguda Diagonal at the site of Poblenou. With a lot of industry combined with offices blocks, housing, university buildings and other services like L'Auditori and Teatre Nacional de Catalunya. Safe and sound up in the air in a cable car in the Montjuïc area in Barcelona. The largest district, covering a surface area equivalent to a fifth of the municapl territory, is Sants and Montjuïc. A well-known area for the 1929 Exhibition and the 1992 Olympics: the Olympic Ring, Picornell swimming pools, major museums, the Botanical gardens and more nature beauty. All around the world artists are trying to make stunning video clips for their songs and film produceres create their best movies on special places. 'Evanescence' with 'My immortal' in 'Barri Gòtic'. 'Shakira' with 'Loca' at the beach of Barceloneta, in/around the famous fountain 'Plaça del Palau' and through the streets of Barcelona. During the year the fountains of Montjuïc still steel the show. In the 'El Poble Sec' area regularly the beautiful fountains rise up in all kind of colours, joined by different styles of music. At the foot of the Montjuic three concentric circles of water jets create a water sculpture of constantly changing, flowing forms. Depending on the time of the year the fountain's show is with music and color light effects, which is during the main season from 21:00 – 23:30h. With the 'Telefèric de Montjuïc' you go by cable car up to the mountain. It has eight seats and you can get on and off at 3 different stations: Parc de Montjuïc, Mirador and Castell. By foot you can see a lot and decide wherever you want to stop. Camí de Mar allows you to have a pleasant 20-minute walk from the 'Mirador de lñ'Alcalde' to the 'Mirador del Migdia'. 'Aeri del Port' is 1.300 meters across the harbor, between Sant Sebastià, Barceloneta, and Jaume I, next to the World Trade Center, to Miramar. More interested in theater or films? Sala Montjuïc is an open-air cinema. Great when the temperatures rise up and you do not like to sit in an air conditioned building. If you want to avoid a traffic jam, then do not pass Plaça Espanya. But it is really worth a visit, as it is the way to Montjuïc, Fira de Barcelona (state-of-the-art infrastructures) and to highlights as 'Parc de Joan Miró' (22 meter high sculpture called 'Woman and Bird'), 'Caixaforum' hosts art exhibitions, concerts, literary and film events and of course 'Poble Español', a compendium of Spanish vernacular architecture. 'Ciutat del Teatre' is a 19th century style building including Mercat de les Flors (dance), Teatre Lliure (theatre), Institute del Teatre (school) and do not forget the 6 theatres with more than 2.000 seats. La Roca Village - The outlet center at only 30 minutes by train from Barcelona. Get your Tommy Hilfiger sweater, Burberry bag, Ralph Lauren or any other famous brand... with discount! La Maquinista - La Maquinista has various shops, restaurants, bars and a cinema! Shopaholics can really go mad at 'Passeig de la Gràcia', which is the 'Kalverstraat in Amsterdam', the 'Via del Corso in Rome', 'Bleecker street in New York' or the 'Istiklal Caddesi in Istanbul'. As in a lot of large cities there is a H&M, a Zara, a Mango or a Berschka. The first mention of its existence brings you back to the 13th century. Since the 19th century it is housed near 'La Rambla', where the convent 'Sant Josep' used to be. That is why it is also known als 'Sant Josep Market'. No matter what, still it is ideal to discover the Mediterranean kitchen from head to toe: (dry) fruits, vegetables, fish, seafood, eggs, cheese, olives and ready made meals. Besides that, there are various tapas bars and a restaurant! Every building has its history, so does this market. In 1884 this project was built under leading of architect Josep Miàs. After the remodeling (between 2005 and 2007) the city of Barcelona awarded Miàs for his project of 5.200 m2. The latest market built in Barcelona, though the first covered one, by architects Enric Miralles and Benedetta Tagliabue of EMBT. You can find here all kinds of products of the area: fruits, vegetables, fish, meat, etc. Also a small supermarket is near. Comparable with the 'Boqueria market'. The differences are this one is larger and with less tourists. Over more than 175 stalls with fresh fruits, vegetables, meat and all kind of fish. Exterior stalls surround the market, selling clothes, household items, gifts, etc. This market is especially known to be a flower market, nevertheless it is also a food market. You can find a lot of things, from many varieties of flowers and equipments to vegetables, meat, fish, bread, cookies, and more. One of the newest markets set up in 2003 supplies in poultry, eggs, meat, pork, sausages, hams, fruits, vegetables, fresh fish and sea fish. There are also bakeries, groceries and various bars. During 1973 this market was opened to provide options to supply food, at the time of its construction. Till now it is still in use. You can find here a wide variety of fresh fruits, sea food, beef, pork, cheese and more. One of the oldest markets is the 'Abaceria Central' (1892). Originally it was an open-air on Plaça de la Revolució. At that moment the market was also known as 'Santa Isabel' and 'Mercat de la Revolució'. A great building made designed by architect Miquel Pasqual I Tintoré. Besides food you can find here plants, flowers, underwear, books, comic books, household goods and clothes. Lesseps is one of the many indoor markets, at the foot of the hill that houses 'Parc Guëll'. Six days a week this market supplies the neighborhood with fresh products. The structure of this market is typically made in the style of the `60, with a a characteristic roof made up of several arches. Are you also interested in 'Camp Nou'? This market is located near the football stadium 'Camp Nou'! In a former municipality's town hall this current Sant Gervasi is located. Les Tres Torres is a market built where a former film studio used to be. One of the most beautiful markets of Barcelona, listed as an artistic monument. Near where the magical fountains are held and the sport area with swimming pool, athletic fields, etc. This market is a 'look a like', in architecturally way, with 'La Concepció'. Started as an open air market in the mid 19the century. Nowadays it is held in a modernist building designed by the architect Falqués I Urpí, with a sales area of 2.583 m2. The market is also known as 'Mercat Nou'. Besides all kind of food you can find bookshops, hairdressers, flower stalls, shoe repair stands, etc. Other things rather then food you can find here aswell, like bookshops, flower stalls, clocks and watches, jewellery, clothes, etc. Two floors with all kind of food, like eggs, meat, Spanish hams and sausages, fruit, vegetables, bread and specialists like hairdressers, clothes stalls, cleaning products and flowers. Almost 2.000 m2 where you can buy all kinds of food, household items and other non-food products. A mixture of fruit, vegetables, delicatessen, clothing and more. The market 'Sant Andreu' is located at the heart of the district 'Sant Andreu'. 'El Besòs' supplies in food and non food products, such as perfumes, cosmetics, clothes for children and adults, gifts and other things like decorations. This is Barcelona's largest and best known flea market. Flea market where you can find collectors items of books, comics and things like drawing materials, stamps, etc. Caixa Forum offers inside art, but don´t forget to take a look at the outside. Which is quite interesting aswell. CaixaForum - An exposition center with a collection of more than 700 masterpieces of Spanish and international artists. There are temporarily expositions and a few pieces are on a permanent exposition. CosmoCaixa - The renovated science museum with the imitated Amazon rain forest, the planetarium, a geological wall with all kind of rocks, all areas completed with fish, amphibians, insects, mammals, reptiles, birds and plants. Museu de la Xocolate - Devoted to chocolate? In Barcelona are many shops which sell chocolate, but 'Museu de Xocolate' is a special in its kind. During the tour you start with the history of chocolate, how to make chocolate, Barcelona made of chocolate and a very nice part of tour in the museum is that you are able to learn how to make chocolate sculptures! Museu de Geologia - Geologic aspects are shown with over more than 15.000 different minerals, 14.000 rocks and 100.000 palaeontological pieces. Museu del Perfum - Who does not like to smell nice? The subject perfume from the days of the Romans till now. With over 1.000 perfumes from different parts of the world and different kind of cultures; Egyptians, Israelian, Etruscans, Romans, Arabs and other ancient cultures. Museu d'Història de la Ciutat (MUHBA) - In a new concept, by moving around the city, this museum explains the history of Barcelona to you. With protagonists, as Plaça del Rei, Temple d' August, Via Sepulcral, Domus de Sant Honorat, El Call, Santa Caterina, Monestir de Pedralbes, Vil-la Joana, Refugi 307 and Park Güell, it counts more than 2.000 years of history! Museu Europeu d'Art Modern (MEAM) - Are you interested in impressive modern art? Do not forget to visit the MEAM. This museum exhibits fine modern art of the 19th, 20th and 21st century. There is a special concept with the 'Funcació de les Arts I els Artistes' to support the artists of the museum. This is inherent to the economic and financial situation of the 21st century. If you can't get enough of the art, 'Museu Picasso' is only a few steps away. Museu Nacional d'Art de Catalunya (MNAC) - 1.000 years of art in one museum of general history of Catalan art made between the Romanesque period till the mid 20th century. In the sculptures, art work/objects, paintings, drawings, posters, photographs and coinages you see in all kind of styles of Modernism, Noucentism, Baroque, and Renaissance. Masterpieces from anonymous artists and artists like Bernat Martorell, Pere Sanglada, Francisco de Zurbarán, Rubens and Ramon Casas. Museu Picasso - Get to know the works of Pablo Ruiz Picasso in 'Museu Picasso', divided over 5 large edifices characterized by the Catalan civic gothic style. According to art experts this is one of the world's largest collection of Picasso's work. Palau de la Música Catalana - An incredible theater of 1908 taking you back to the turn of the century if it is up to its architecture. Pick your spot on the beach of Barcelona! Ideal place with the sunny beach and even palm trees. Barcelona is one of the unique cities, besides for example Miami, Sydney and Rio de Janeiro, who can say they have several beaches and even one near the center! Most of the beaches are not very wide as they are artificial made with coarse sand. Though this does not change the fact that Barcelona has a huge coast line of more than 4km beach! Together with Playa de la Barceloneta it are the two longest beaches of Barcelona. Barceloneta's beaches are the main attraction of this district, packed with bathers in summer and used all year round y people. The beach of 'Nova Icária' is near 'Port Olímpic', which makes it a quite busy place with pleasant temperatures. This beach is adjacent to a long boulevard of stone. A perfect spot if you want to jog, skate or bike. A breakwater splits the beach of 'La Mar Bella' with 'Del Bogatell'. Especially known as a nudist beach. Nevertheless there are a lot of people wearing bathing suits, bikini's or what so ever. One of the rare beaches known because of its peaceful apearance. The newest beach of Barcelona, 2006, with a lot of high buildings with luxurious apartments and shopping center 'Diagonal Mar' nearby. Barcelona is well-known for its nightlife. Have a dance in one of the coolest clubs where famous people come aswell. Go out in style or have fun during a foam party. Even if you are not a real disco dancer or you prefer to chill in one of the fancy bars, it is really worth to go out! Various clubs do not have a set price, it depends on the night: which DJ is playing, how many are already in before (around) 01:00h and if you have one of the flyers wit special offer(s). Thursday evening is, like in more student cities, student night. Because of that, it is often quite rewarding with the free entrance. Friday and Saturday night are the most popular ones. Please pay attention to the fact that alcohol ingestion is prohibited in Spain. And also not unimportant, there are certain dress code. A very common one is no sneakers/sport shoes for guys. 'Bikini' one of the best gig to enjoy concerts, alternative music and more. Officially there are two rooms, but they can be joined together by a movable partition wall. Depending on the night the music variates from salsa, latino, house, 80s, 90s, Hip Hop and everything what is in between. 'Costa Breve' gives you the vibes of hits, pop, rock, dance and house! All under one roof. From the 60s it was a classic in Barcelona. A night with minimum techno is possible in 'Magic Club'. Have a stunning night full of 80s, pop, soft rock and disco classics. 'ElRow' is one of the places to go to for live tech-house beats. Artists who are on stage, are for example Carlo Lio, Marc Maya, Luca Bachetti, Sydney Blu, Toni Varga, Oscar Aguilera and more of this caliber. 'Opium Mar' is ideal to spent the early evening for a drink in the lounge area and a good diner in the unique restaurant. Meanwhile you can enjoy the beach views from the large terrace. The night you can start with house music in its nightclub. 'Otto Zutz' is a trendy, cool club though not over the top. Every floor has another type of music: Funk, Hip Hop, RnB, Soul. 'Sala Becool' is a nice place to enjoy electronic music and concerts. If you want some good quality house, techno, deep house and disco,... do not forget to spent some time in Sala Becool. 'Sutton' is for locals and tourist a place to be! Two floors filled with Hip Hop, house and funk. Like to catch the eye of a famous football player, artist or movie star? This glamorous club is one of the places you are able to find them who ever is in Barcelona! 'Plataforma Club' offers space for more than 500 music and dance fans of Drum'n bass, dubstep, ragga jungle, etc. Thursdays is the essential drum'n bass night. The intense Spanish music flamenco can not be missed in this part about the nightlife in Spain. Flamenco is a form of art from Andalusia, the gypsies from the South of Spain. For them it was a way to express their pain and suffer. During the years it became a popular attraction in the rest of Spain. During one of the live shows in for example 'Los Tarantos' or 'Tablao Cordobes' to have a dynamic and cosy evening with live flamenco combined sometimes with other Latin music. IMAX - In Port Vell Barcelona is 'IMAX', a large cinema where you can choose out of different kind of technologies to watch one of the movies. Which of the 416 seats is going to be yours?. Teatre Nacional de Cataluña (TNC) - The appearance is eccentric in the shape of a Greek temple can be found in 'Teatre Nacional de Cataluña'. The complex exists out of 2 different parts: The main building contains Sala Gran, Sala Petita and some offices. The other part, in traditional modern look, is Sala Tallers. In the 3 theaters there are performances of Catalan and Spanish plays and of course world classics. Also performances for children are nowadays part of it (opera, circus, dance and other performances). Gran Teatre del Liceu - An old world opera building with 3 sections. If you are interested you can join the tour, including a guide who tells great historical and interesting stories. Therefor you do not need to read all the books and surf the web. Mostly every guide has its own extra personal touch on a story, which makes it even more attractive. One of the oldest amusement parks in the world! No matter what your age is, there is for everyone something: 25 rides (including the Falkirk Wheel), great shows and all kind of theater. The 'Tibidabo Sky Walk' is a big event. From 500 meters you have a stunning view of Barcelona! Time for a break? Of course there are plenty of places to have a drink or something to eat. For the ones who prefer to sit outside, get a spot on one of the picnic areas! Devoted to chocolate? In Barcelona are many shops which sell chocolate, but 'Museu de Xocolate' is a special one of its kind. During the tour you start with the history of chocolate, how to make chocolate, Barcelona made of chocolate and a very nice part of tour in the museum is that you are able to learn how to make chocolate sculptures! Football is a part of life in Spain. Barcelona is pretty well represented in the world of football. Kids will have the time of their live in this 5 star of its kind, the FC Barcelona stadium. Feel the Barça vibes with your kid(s) or just chill by yourself: walk through the welcome area of the Camp Nou Experience, take a look in the press boxes, follow the way of the players in the players' tunnel including appropriate music on the background, keep on going and end up in the pitch, just as the players you go to the changing rooms, the mixed zone and the press room. You will probably recognize the walls from one of the conferences when one of the players spoke with the media. And this is not all! Together with your kid(s) you can see the triumphs, get to know more about the history of Barça on an interactive way, in the multimedia zone is a big touch screen where you can find information and statistics about the presidents, managers, supporters clubs and much more in the museum of FC Barcelona. Note: Check before your visit if it is a match day. Because for example 3 hours before the kick-off the museum closes. The second largest aquarium in the world! More than 14 million people visited this great underwater world. It consists out of 3 sections, with each its own highlights. Walk along with the sharks and other 11.000 animals while you go through the 80 meters long tunnel in the Oceanarium. Who does not want to do that at least once in a lifetime. There are permanent exhibitions to discover on a active way the underwater world. For families there are all kind of activities, like sleeping with sharks, various of workshops and guided tours. One way or the other, you have a nice day where you see and even learn a lot in a pleasant way. There is always sunshine somewhere, but unfortunately once in a while there is a cloudy, rainy day in Barcelona aswell. What is a nice thing to do, as kids like to run and enjoy themselves? There are some indoor parks like Aventura Park, Chupipark, Jocland, Malup Parc, Waki Park, etc. Abseiling and rock climbing (12 meter rock face) - at only 40 minutes outside Barcelona. Bridge jumping - from a height of 40 meters at 50 minutes outside Barcelona. Canyoning - a combination of potholing, swimming, hiking and mountaineering. Only 50 minutes outside Barcelona. Potholing - with potholing you will discover hidden underground secrets of Cataluña. Water sports - at the beach of 'Mar Bella', 'centre Municipal de Vela Port Olímpic' for sail lessons e.g. Winter sport - in a 2-3 hours drive from Barcelona and on the mountain of the Montjuïc is an artificial ski slope. Around the world internet is almost unthinkable in a lot of people's life. In several public areas you will be able to go online, like in coffee shops, restaurants, bars and shopping malls. Nowadays Barcelona also provides WiFi areas in various parks. A few examples are Parc de la Ciutadella, Parc de l'Espanya, Pista Poliesportiva del Parc de la Creuta del Coll, Casal de Gent Gran del Parc, Parc de Cervantes, Parc de la Pegaso, Camp Municipal de Futbol Parc Catalana, Parc del Labirint d'Horta, Parc de Joan Miró, Parc Guël and Jardins de la Casa Elizalde. A traditional festival for the feast of Saint Anthony, known as 'Els Tres Trombs', referring to the 3 rounds people made with horses. 'Dolçe festa' is a celebration with a festive procession and thousands of kilos of candy disseminated. The fiësta stands along the 'Carrer Hospital' to sell spices, herbs, honey and candied fruit on the day of the patron saint of beekeepers and spice growers. Fire works, bonfires in various streets and squars. A celebration in which every neighborhood has its own celebration. One of the most spectacular is 'Festa Major de Gràcia'. The day with the Catalan anthem and separatist demonstrations. For 5 days the largest street festival takes place. It is in honor of 'Mare de Deu de La Mercè', Barcelona's patron Saint. With a bang of a lot of fire works near the statue of Columbus to say goodbye to the summer and they welcome the autumn, all together with processions, concerts, music and dance. One of the biggest events are that there are events, parades and fire runs are the Castellers and Gigantes. Castellers is a festival they built human towers with on top a young child. This is held at Plaça de Sant Jaume. Gigantes is a Giantes parade of kings, queens and nobles between Plaça de la Mercè, Barcelona Cathedral and Plaça de Sant Jaume. Christmas is a traditional celebration at home with family and the old custom called 'fer cagar el tio'. This means that an object, similar to a tree trunk put in the fire, from out of which presents will come out.